Animal Wildlife | Proboscis Monkey | The proboscis monkey is a large tree-dwelling primate found exclusively on the island of Borneo in south east Asia. 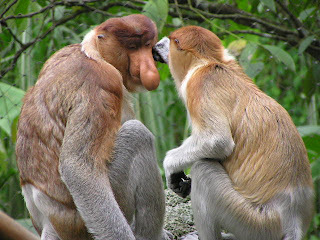 The proboscis monkeys are best known for the long noses of the males, which are thought to be related to mating in order to attract females. The proboscis monkey has a large protruding belly that is thought to stick out so much due to the proboscis monkeys diet and complex digestion system, which along with the long nose of the males, gives the proboscis monkey very distinctive yet strange characteristics. 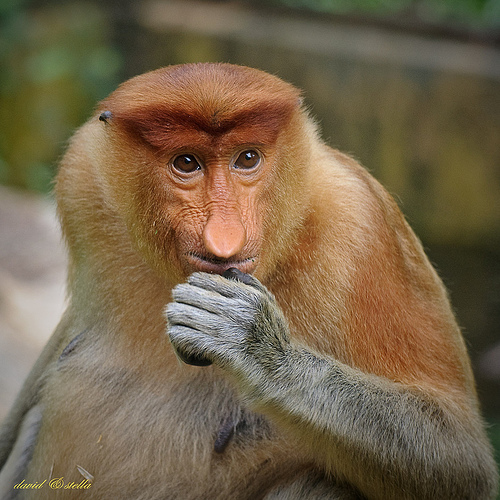 A study at the end of the 1980s showed that there were around 250,000 proboscis monkeys in the wild. 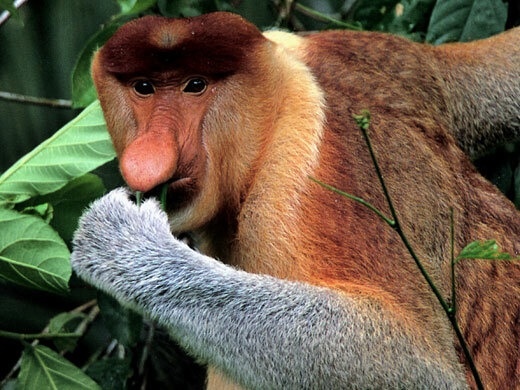 Today there are thought to be considerably less of the proboscis monkey in the wild due to hunting and deforestation. 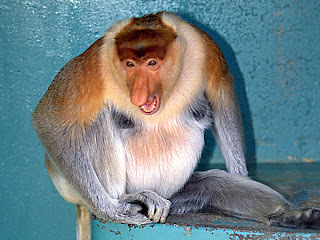 The proboscis monkey is considered to be an endangered species. 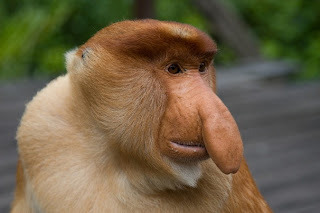 The males proboscis monkey is much larger than the female proboscis monkey, with the male proboscis monkey being about double the weight of the female proboscis monkey. This size difference between gender is thought to be greater than that of any other primate in the world. 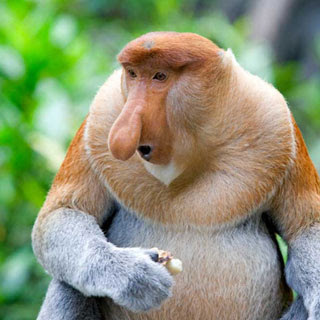 The proboscis monkey is a proficient swimmer and appears to spend a large amount of time in the water. 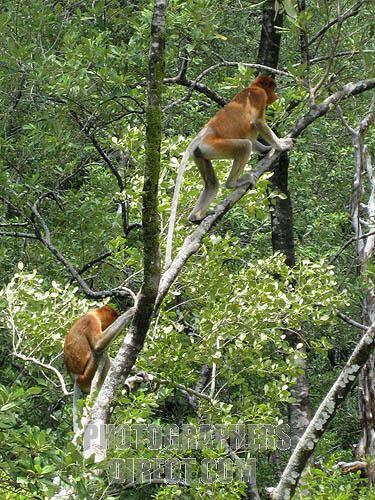 Proboscis monkeys are most commonly found inhabiting mangrove swamps and will wade through shallow water and can swim when the water gets too deep. Proboscis monkey troops consist of the alpha adult male and a number of females, as well as their offspring. It is not uncommon however for both the male and female proboscis monkeys to move between social groups. The diet of the proboscis monkey consists mainly of leaves, shoots, seeds and unripe fruit. It is known that proboscis monkeys are not too fond of fleshy fruits and the complex nature of the digestive system of the proboscis monkey means that they are unable to digest ripe fruit. 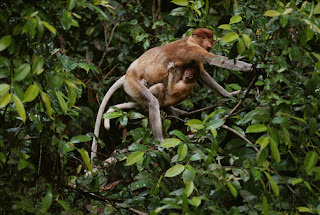 Female proboscis monkeys give birth to one baby proboscis monkey after a gestation period of nearly 6 months. The baby proboscis monkeys are thought to be born with much darker fur, and small noses which grow in size as the baby proboscis monkey gets older. 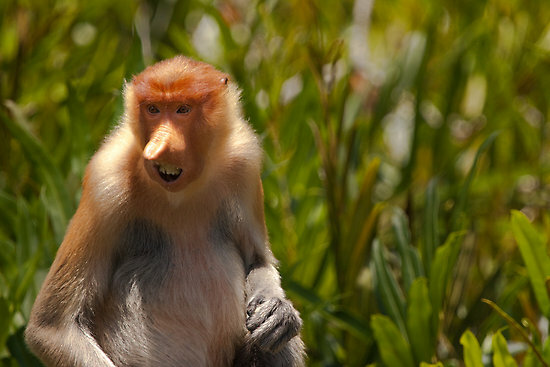 The reddish fur of the adult proboscis monkey is lthought to appear with age. 0 Response to "Proboscis Monkey"